Do you know what you want to achieve out of your life? Do you know exactly what kind of results you want to have and what kind of lifestyle you want to live in the next 5 or 10 years? 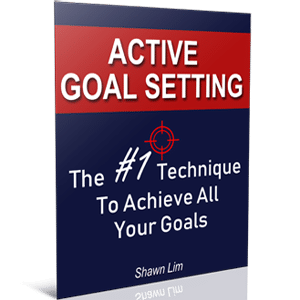 Goal setting is a very common topic that almost everyone talks about, but the sad truth is that people are not treating their goals seriously and they don’t understand the importance of having a goal. I believe that everything you want starts with a goal. A goal, in fact, is an intention. When you write down your goals, you are telling yourself what you want to achieve. You’re consciously living an intention-driving life. Think about it, if you have no intention to be financially free, would you go and read books about making money and creating wealth? If you have no intention to play tennis and you have no intention to master the game, you will never put in the effort to train yourself or take part in the competition. It all starts with an intention. And goal setting is just a form of stating your intention in a more specific way. When you set a goal, you become focused. You know what you want to achieve and you can then consciously make decisions and take the right actions to reach it. On the other hand, when you don’t have a goal, you become aimless. You have no idea what you want to achieve out of your life. As a result, you follow the crowd like a lost sheep. You do whatever people ask you to do. You go wherever the flow brings you. When you don’t have a goal, you become reactive rather than proactive. You react to things that are happening around you. You become all things to all people. You will do whatever you feel like doing. This is no problem at all. Having no goals are absolutely okay, but if you desire to achieve greater success and you want to produce extraordinary results in life, you need goals. You need to consciously make decisions to get the things that you want in life. In his best-selling book, Awaken The Giant Within, Tony Robbins shared the metaphor that life is like a raging river. When you have no idea what you want, you will flow through the river aimlessly. You go wherever the current takes you. And because you have no idea what you want to achieve, when you reach a fork in the river, you don’t consciously decide where to go or which is the right direction. You will become a part of the mass of people who are directed by the environment instead of by your own values. And one day, you will discover that you’re just five feet from the Niagara Falls in a boat without oars. Without goals in life, you feel out of control. When you have goals and you understand what you want out of your life, you can then take charge of yourself. You become conscious of the things you want. You can create plans and make conscious decisions to get there. In other words, when you have goals, you’re in control of your life. So stop living life aimlessly. Stop going wherever the flow gets you. Instead, start to take control of your life by setting goals that get you where you want to go. Do you know that having goals can make you more accountable? Rather than just talk, you are now holding yourself accountable to act. When I first started this blog, Stunning Motivation a few years ago, I set goals to publish a certain number of good content each week, to achieve a certain number of traffic count and subscribers a month. And every time when I reminded myself of my goals, I’m holding myself accountable to act. I become more committed. I don’t just merely think or say what I want to achieve. I write down my goals. I create plans to achieve them. And I actually follow through to get the results that I wanted. No matter what you want to achieve in life and at work, you need to first set it as a goal. Once you have a goal, then you can create plans to get there. Monitor your progress as you proceed and move forward each day and each week. When you don’t have a goal, you have nothing to commit to. You have nothing to hold yourself accountable. So start with goals and then make plans to achieve them. One of the most important keys to success is your focus. And your goals can give you the focus you need. It doesn’t matter how much talent or ability you have, if you don’t know how to focus and put your capability through the right passage, you will waste all your energy and effort. Imagine if you want to shoot an arrow. No matter how good your skills, you will never hit if you don’t have a target to aim at. In fact, it is not about how good you are. It is about knowing what you want and focus on it. Even if you have no idea how to bake a cake. As long as you have a clear goal that you want to do it, you will ask around, you will attend classes to learn how to do it, or you’ll just jump straight in and bake with whatever knowledge you have. The key is that when you have a goal, you become more focused. For example, I have no idea how to build a website or how I can turn my blog into a business. But because I have a goal that I want to do all these, it forces me to think, to brainstorm, and to learn how to get there. As a result, I search, study, and learn how I can build a successful blog. Without this goal, Stunning Motivation will never make it this far and will never become what it is today. Do I need to explain more on this? Goals inspire and motivate you. If your goals don’t motivate you, perhaps, they’re not exciting enough or they may not be the right goals for you. One main reason people fail to achieve their goals is that their goals don’t inspire them to act. They set goals that are not exciting to them. When your goals are NOT emotionally attached to you, you will lazy or even boring to act. You will procrastinate. You will do what is convenient rather than what is required. But if your goals are exciting, inspiring, and motivating enough, they become the driving force for you to act each day. Ask yourself – are you dreaded to wake up each morning or you can’t wait to get up to work on your goals? If you feel dreaded, your goals are not exciting enough. You have to make them inspiring and exciting so you’ll jump out of bed each morning to take action. Nobody will set a goal to become mediocre. People set goals to achieve better results in life. Thus, your goals make you grow. When you’re earning $5,000 a month and you set a goal to earn more than that, you force yourself to go out of your comfort zone to do something different. You become more hardworking and you will have to grow yourself in order to achieve that goal. If you keep doing what you have always done, you will get what you have always got. Therefore, to achieve better results, you need to improve yourself. You need to force yourself to do something more or something different. This is how goals can help you grow. When you set a higher target, you have to grow yourself and become someone better to achieve it. Think about it, without goals, you will fall into your routine and do what is comfortable. But when you’re in your comfort zone, you’re not growing. By setting a higher goal, you have to stretch yourself beyond what you normally do to reach it. Besides helping you become more focus, your goals also help you eliminate distractions. If you have a meeting in the office at 9 AM and it takes 20 minutes’ drive from your house to your office, would you be distracted along the way to your office? When you leave your house at 8:30 AM, would you stop by somewhere else, take breakfast, or send your clothes to the laundry on your way to your office? No, you will not. You know how much time you have and you know what time you need to get to the office for the meeting. You will not be distracted by other things. Even if someone calls you and invite you for breakfast, you will reject them because you know you have a meeting to attend and you need to reach your office by what time. Unless you change your plan, which is to get out of your house earlier to buy more time, you will never be distracted. This is the power of having a clear goal. When you know exactly what results you want, you not only become more focused, the goal helps you eliminate all unnecessary details to get there. Whether you want to accept it or not, goals get you results you want. Like I said, goal setting is actually an intention setting. When you write down what you want to achieve, you are actually creating specific intention in your head of what you want. And if you look at all the outstanding success that extraordinary people created in their lives, you will notice that they are all living an intentional life. They know what they want. They have an idea of the kind of lifestyle that they want. They pursue it, and then they created extraordinary results. Success is not an accident. It is engineered. Professional athletes like Michael Jordan, Kobe Bryant, Usain Bolt, Lionel Messi, Ronaldo, etc, did not build their career through luck. They become who they are today because they have a strong desire for what they want – to master their craft. They are passionate and they love what they do. It doesn’t happen by chance, but by design. And setting goals is just the first step of turning what you want into reality. This is why it is extremely important to have goals in life.